Ken Evancic, chairman of I.C.S., Inc. began his corporate career in the insurance industry as a claims adjuster for State Farm Insurance Company in August of 1979. After 5 years of servicing policyholder’s needs who suffered some type of damage to their homes and being less than satisfied with the service provided by local contractors, he left the insurance company to take a sales/estimator’s position with a small local general contracting firm. In 1985, he started Insurance Construction Specialists, Inc. (I.C.S. Inc.), a company specializing in residential repair for insurance related types of damage. The types of repairs I.C.S. Inc. focused on involved numerous aspects of residential repair including fire, water and storm related damage. Once his customers experienced the quality of service and workmanship his company provided, they requested non-insurance related projects such as roof, siding, seamless gutters and window replacement as well as room additions, kitchen, bath and basement remodeling. Recognizing his customer’s desires, the focus of I.C.S. Inc. shifted from predominantly insurance related repair projects to remodeling and general home repair. In 1993, Ken was introduced to a product called Gutter Helmet and had it installed on his personal residence in Indianapolis. Being so impressed with the performance of the Gutter Helmet Protection System, after replacing the roof and gutters on his newly acquired home in Carmel, he had Gutter Helmet installed on that home. Out of the hundreds products he used in the residential repair business over his 30 plus years in the construction industry, he was so impressed with the performance of Gutter Helmet that he decided to pursue a dealership position with the company. In July of 2015, he was granted the Gutter Helmet dealership in the Indianapolis area now focuses on the product that he truly believes in. 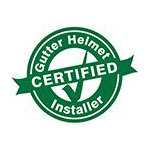 For over 30 years, Gutter Helmet has been the most trusted name in gutter protection systems. The unique, patented nose forward design ensures that water flows away from your home, and not into it. Gutter guards keep dirt, debris, animals and leaves out of you gutter so they cannot cause clogs or unwelcome overflows. If you are interested in having the Gutter Helmet gutter protection system installed on your home or in any of our other home improvement services, such as seamless gutters, call (800) 824-3772 or fill out our online form for a free quote.